Snow has caused minor disruption to public transport services across the region. Bus and train services have been severely delayed and some routes have been cancelled. Keep updated with changes to services throughout the day with the Halifax Courier online. Halifax bus company TJ Walsh has not cancelled any of its service routes, at 9.30am this morning, and said it will operates its services subject to the weather. Delays to services are to be expected, it said. West Yorkshire’s First bus company announced its services are “severely delayed due to the weather”. Service 681 is not operating from Northowram until further notice. Halifax services 521, 522, 523 will terminate at Cousin Lane/Keighley Road (Morrisons) and operate as circulars. Bus 560 will now terminate at Rishworth. The number 510 service will not serve Hollins Lane and bus 542 will miss Court Lane stop, near Norton Tower, Halifax. Bus services to Leeds and Bradford are heavily delayed, First reported. 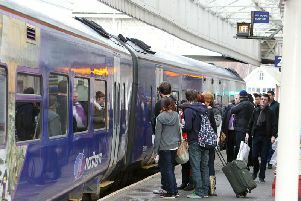 Northern Rail tweeted: “Northern Rail is currently not being affected by UK snow”.